A Collection of vector robber characters that is available for free download. 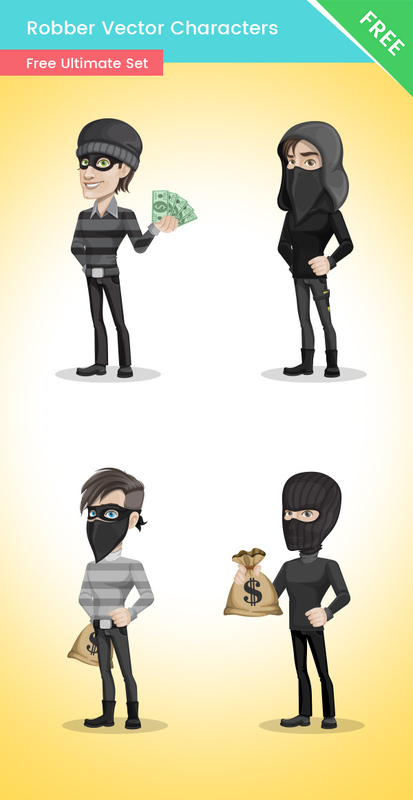 This Robber Cartoon Vector Pack includes 4 robber characters, all made of vector shapes. This collection is perfect if you want to illustrate stealing, security or protection. These characters are made only with the usage of vector shapes, so they are completely customizable. You can easily change their colors or shapes to make them compatible with your awesome design. What will you find in the download file? A Cartoon burglar with a hood and knife. A Cartoon thief with a money bag. If you are not interested in the vector files, we’ve got you covered! We’ve included a transparent .png file so you can use the graphics without vector based software.